I have been reading articles today concerning the mainstream media’s observation (some might say “obsession”) that NICS background checks for Black Friday 2018 were down as compared to Black Friday 2017. In light of these articles, I thought it might be useful to put some of this data, and these reports, into perspective. 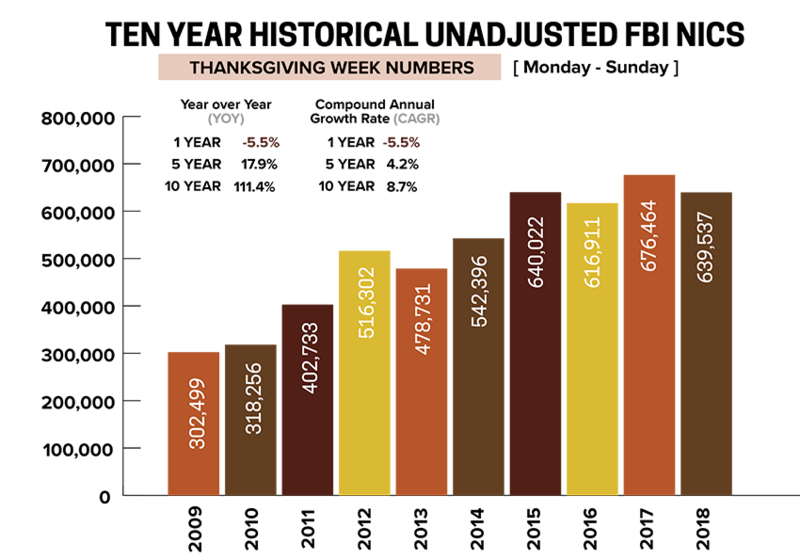 In reviewing the Ten-Year Unadjusted FBI NICS data for the week of Thanksgiving, we see some interesting trends developing. And, at a meeting between NSSF staff and FBI personnel at the NICS headquarters in October, the FBI was actually pleased that many retailers were doing promotions in advance of or in addition to Black Friday. By doing this, both the retailers and the FBI – NICS system were alleviating the stress and strain of an extremely high volume of checks on Black Friday alone. The Monday before Thanksgiving 2018 had the highest number of NICS checks ever for that specific day. 83,970 checks were performed. While this number was up only 715 checks over 2017, it is up by over 3,000 checks for the next highest year (2015). Likewise, the Tuesday before Thanksgiving saw the highest number of NICS checks ever for that specific day. This year, 91,271 checks were preformed, which far outpaced 2017 (by more than 5,000 checks) and was 1,680 checks higher than the next highest year (also 2015). The Saturday after Thanksgiving was higher yet with a total of 98,020 checks performed. This was the highest total of Thanksgiving week (with the exception of only Black Friday), and this number far outpaced all other post-Thanksgiving Saturdays. This figure was more than 3,000 checks higher than 2017, and more than 2,500 more than the next highest year (coincidentally, also 2015). Also of note is the fact that Thanksgiving Day itself saw the second highest number of checks, being narrowly edged out by 2017 (by 372 checks); likewise for the Sunday after Thanksgiving, coming in second only to last year’s total, but outpacing all previous years by a wide margin. So, the takeaway from all of this number-crunching and obsession with Black Friday 2018 sales is that while NICS checks were down overall from 2017, it’s not enough to focus on that one specific day. With many retailers expanding their promotions to the entire week of Thanksgiving, one should look at the bigger picture. There are a number of factors that determine the gun-buying habits of consumers, and trying to draw any conclusions from looking at one day of NICS checks is inappropriate and misleading. The sales for the week of Thanksgiving were the highest on record when compared to all previous years, with the exception of 2015 and 2017. A simple analysis of the past 10 years’ data shows a decidedly upward trend, and reports are that the inventory levels are stabilizing and that the quantity and quality of firearms and ammunition are readily available throughout the year. All of these portend well for the industry. Joe Bartozzi is the president of the National Shooting Sports Foundation, the trade association for the firearms industry.